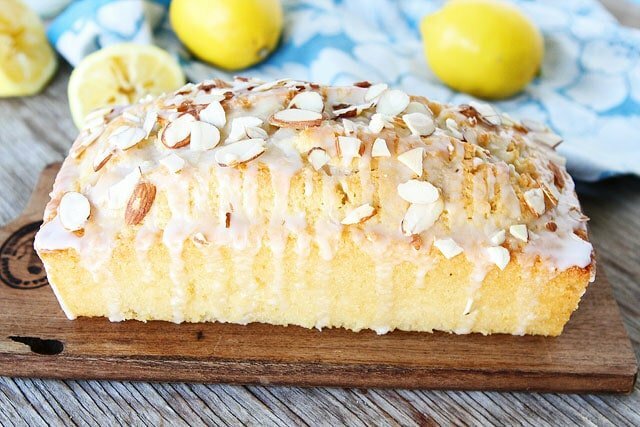 Lemon Almond Bread-super moist lemon quick bread topped with a sweet lemon glaze and sliced almonds! I am on a serious lemon kick. I can’t stop! I’ve made lemon pasta, cookies, pancakes, and even a grilled cheese sandwich. Yeah, I am kind of obsessed. My love for lemon continues with Lemon Almond Bread. 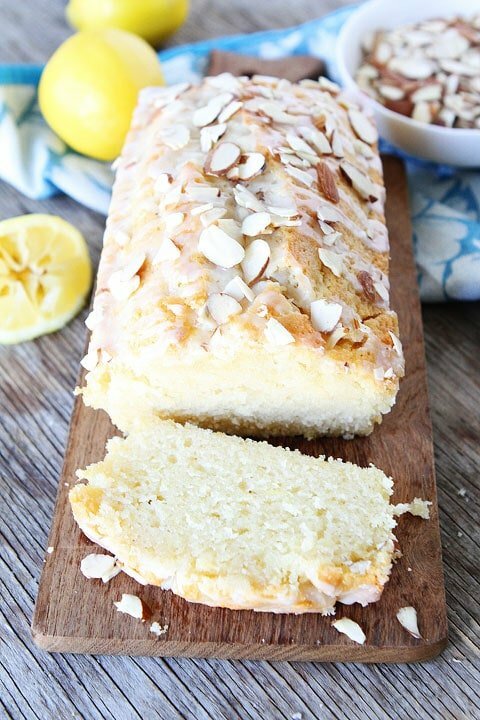 I would apologize for my lemon overkill, but I am not going to because this Lemon Almond Bread is out of this world good. You will thank me and my crazy lemon kick after you taste this bread. This Lemon Almond Bread is so good that I didn’t want to share it. I was going to fill a pretty plate with slices of bread for our neighbors, but I couldn’t part with it. I know, I am selfish, but I promise I will redeem myself by making another loaf to share. 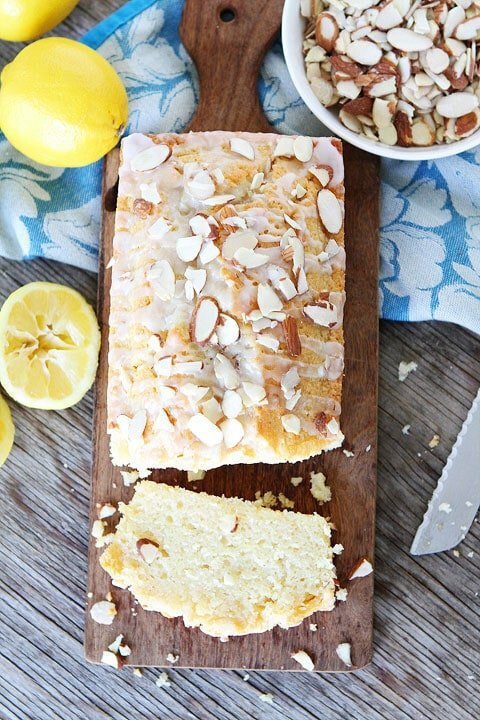 Lemon and almond flavors team up to create an outstanding loaf of bread. I used Almond Breeze Almondmilk and almond extract to bring out the almond flavor. This bread will also make you pucker up a bit thanks to the lemon zest and fresh lemon juice. And I didn’t stop there. After the bread was done baking, I drizzled a sweet lemon glaze over the top. I also sprinkled on sliced almonds. Look at that pretty loaf. Almost too pretty to cut into! I enjoyed slice after slice. I couldn’t stop myself. 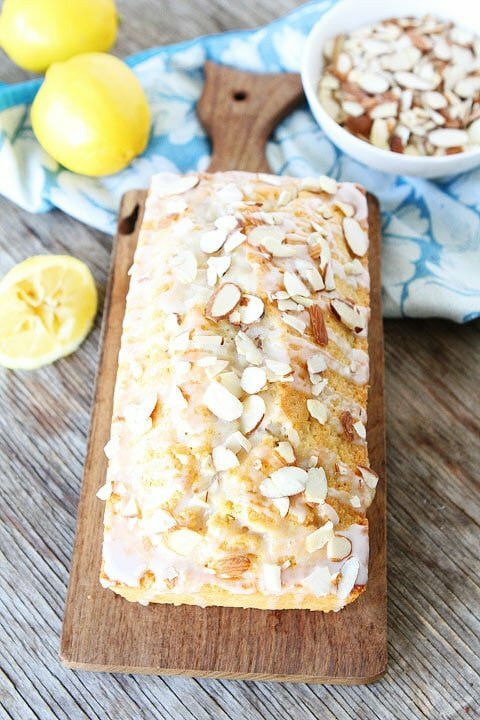 This Lemon Almond Bread is a new favorite! I am calling this Lemon Almond Bread so I feel better about myself when I am eating it for breakfast. It can easily pass for a lemon loaf cake. Serve it with fresh berries to dress it up! But again, it is bread which means it is totally acceptable for breakfast. Preheat oven to 350° F. Spray a 8 1/2 x 4 1/2 loaf pan with cooking spray and set aside. In a large bowl, whisk together the flour, salt, and baking powder. In a small bowl, combine sugar and lemon zest. Rub together with your fingers until fragrant. Whisk into the flour mixture. Set aside. In a separate medium bowl, combine the almond milk, oil, eggs, lemon juice, vanilla, and almond extract. Slowly add the wet ingredients to the dry ingredients. Stir until combined. Pour batter into prepared loaf pan. Bake for 55-60 minutes, or until toothpick comes out clean. Place the loaf on a cooling rack and cool for 15 minutes. Loosen the sides of the bread with a knife. Carefully remove loaf from pan. Let cool completely on wire rack. While the bread is cooling, make the lemon glaze. In a small bowl, combine powdered sugar, lemon juice, and almond extract. Whisk until smooth. Drizzle the glaze of the lemon almond bread. Sprinkle sliced almonds over the bread. Cut and serve. This is the perfect bread to bring in the warm weather we are finally getting. Beautiful! Love lemon, there aren’t enough recipes with lemon involved as far as I’m concerned. Pinned! It looks scrumptious. YES! 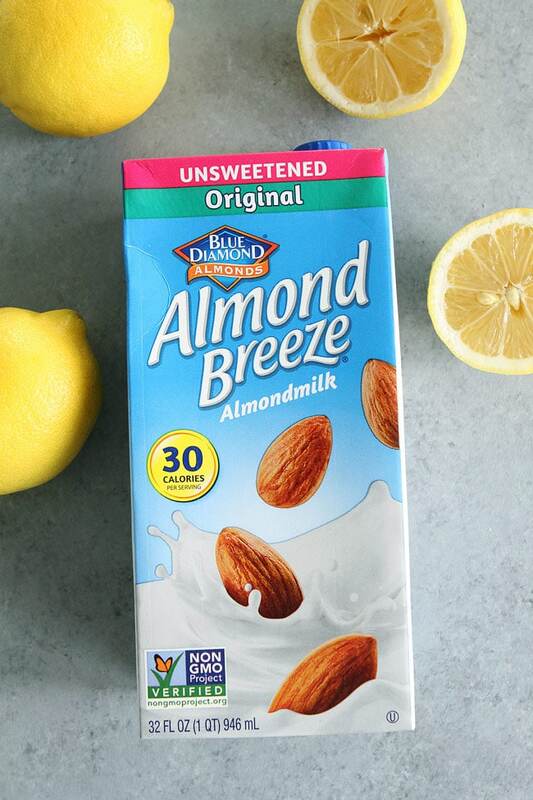 Almond Breeze Unsweetened Vanilla is the only milk that I use, and I am also totally addicted to lemon, so I am allll over this one! Pinned! It is my favorite too! Thanks for the pin! Yum! It looks delicious!! This would be so perfect for breakfast! I love quick-breads like this! So yummy and so pretty! This looks so perfect. 2 of my fave flavors, together! This looks amazing! Lemon and almond go beautifully together! This bread looks gorgeous and sounds so delicious! This would be perfect for taking along to Easter brunch with the family! that’s a delicious combination.. love it!! Soooo pretty! Can’t get enough lemon recipes! Simply Stunning! I want a big ol’ slice please?! So pretty, Maria!! Love that glaze! This brad look awesome Maria! Nice recipe – thank you. I too love lemon. Love this recipe. Anything lemon is perfect for the Easter menu! Delicious flavor combo! Love lemon and almonds together! Love the flavors in this spring cake! OMG this has my name all over it!! we even have Almond Breeze in the fridge!! Thanks Maria! This bread looks absolutely perfect for Spring 😀 Definitely pinning! Looks like a perfect taste of spring! This looks so good! I can’t wait to try it. This looks INCREDIBLE! I have been craving lemon cake of any kind forever now! I love this recipe…so full of flavor and delicious! 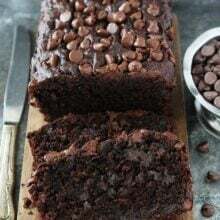 It looks so moist, I want to bite into a slice right now. Thanks for sharing! this looks delicious! i love lemon anything. No aplogies needed for the abundance of lemon treats and dishes! Keep ’em coming! This bread looks amazing, Maria. I love that it’s dairy free. The almonds along with the glaze on top are the perfect touch! And it’s dairy-free! This made my day, I’m definitely making this 😀 Thursday is secretaries day here so I’ll bring it into the office then 🙂 Pinned! How many lemons did you need for the entire recipe? Looks like a bread I would love any time of day. Lemon almond baked goods never last long around here, can’t wait to try this! Would this bread still be moist and tasty if I omitted the lemon? I love almond, but am not really a fan of lemon. 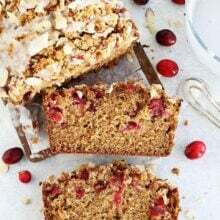 Have been looking for a winning almond bread/cake recipe. Definitely agree that Almond Breeze has the best almond milk! And this cake –I mean, BREAD–looks perfect. I can tell how moist it is just from the pictures! OMG what a recipe! I’ve developed a major thing for lemon desserts lately and then you go ahead and add the amazingness that is almond. This was obviously meant to be because I already had all the ingredients… It’s pinned and the cake is cooling on my counter now. I was on a peanut butter kick a while ago, but I think your serious lemon kick is healthier. I really need to buy more lemons! This looks fabulous! This is such a pretty loaf! And we love anything almond. A must! Lemon and almonds are meant to be. There is no such thing as lemon overkill. Love this bread! 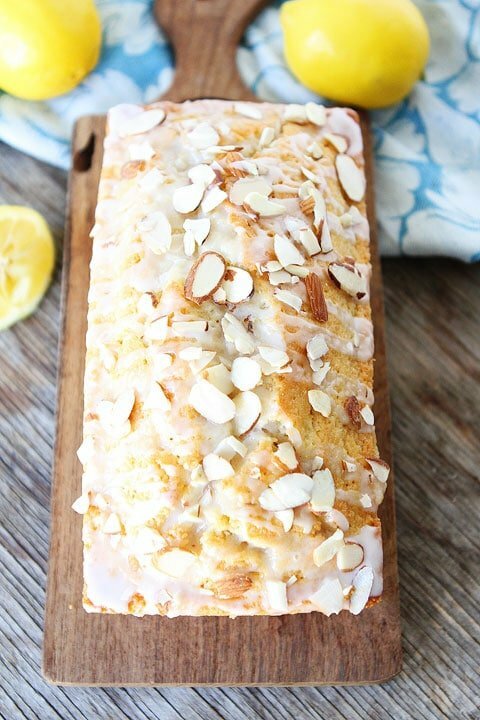 This Lemon Almond Bread is outstanding! I just tried it and will make a bunch of smaller loaves to share with my guests on Easter. Love using the Almond Breeze Milk and all the fresh lemon. Two of my very favorite flavors – never thought to put them together! Looks amazing. Pinned to try soon! I love lemon too but I am an Almond Breeze addict. I sub it for both milk and buttermilk all the time. I crave oatmeal made with it. Crazy, I know! This would be so good with the lemon curd i have sitting in the fridge. Looks delicious and beautiful as well. This sounds so incredible and looks beautiful! I love the flavors of lemon with almonds! This has my name all over it! I just made this last night and it was AMAZING!!! I had guests over and when I went back in the kitchen, it was gone. It was a definite hit. Thanks! I am thoroughly looking forward to making this. It looks just lovely. Poppy seeds will make this “bread” even tastier perhaps?? Such a pretty bread, love the lemon and almond flavors! I’m new to the whole almond milk idea. If you were to use the original Almond milk, not the unsweetened version, would you need to reduce the amount of sugar to be added? I want to make this in the morning but only have the sweetened version. Just made this and it was awesome. Best when it is warm with a cup of coffee. Thanks for sharing. A keeper!! I have Vanilla flavored Almond milk, think that will work out ok? Pingback: . link love 4/20 . - . running with spoons . I made this for Easter. It was good but it had very little lemon flavor. The almond extract was too overwhelming. I just made this and it’s delicious! I might make another one to take to work tomorrow since everyone will love it. I used 1 flax egg instead of two regular eggs, cut down the sugar a couple tablespoons, and made only half of the glaze. I also used 1 cup white whole wheat flour and .5 cup AP flour. I’m worried I’m going to eat the whole loaf today 🙂 The bread is moist, tasty, and filling, while the glaze is super sweet and tangy. Thanks for the recipe! I have made this recipe twice and both times and both times yummy-o…thanks for the recipe..I am definitely a fan! Looks yummy! Any idea whether you can sub the all-purpose flour for almond flour? I haven’t tried almond flour. Let me know if you try it! I’m planning to try this, and I’ll be trying a batch with coconut swapped in for the almond. My sweet nephew can’t have anything nuts, so I’m hoping it’ll be just as yummy so he can have some too! Can you make this with regular whole milk? Wow! Just made this and holy cow…..it’s amazing. I just cut the sugar by 1/4 cup ( I’m a diabetic ) still tastes fabulous . Highly recommend this recipe. I baked this bread this afternoon – it is wonderful! The one thing I forgot to pick up at the store was almond milk but I replaced the liquid with coconut water that I had on hand. It still came out great! I had a lemon that was just waiting to be used, but I had to find the perfect recipe for it. I came across this one and decided I had to try it. I wasn’t disappointed…..this bread is the perfect lemon & almond combination. I’m about to enjoy more with my coffee! Thanks once again for a wonderful recipe! Amazing and tasty! I substituted and used Bob’s Red Mill Spelt flour. It came out delish! I made this as muffins for a baby shower, and they were delicious! The muffins took about 25 minutes to bake. I thought they tasted better once they sat overnight. Yay! Glad you liked the recipe! This was so delicious. Made it for a party at work and was a big hit! How come mine didn’t turn out a bit fluffy like what your guys had on the photo? Did I miss something? I made this bread last Sunday. My hubby, who is very strange about food, said Blah, Lemon Yuck. Fine, more for me. He sure changed his tune. The flavor of the lemon and almond is wonderful and the glaze with the slivered almonds puts it over the top. I made 2 loaves, gave 1/2 of one to my duaghter who just had a baby and we ate the rest. Needless to say, my hubby loved it and so did my daughter. When will he learn? This recipe will be a regular in my house! I hope you don’t mind, but I embellished with a sprinkle of fresh blueberries that my husband grew in our garden – this was the biggest hit at our university faculty meeting. I’ve turned many people on to your website (although I was tempted to take full credit – but, as a former journalist and now a part-time journalism professor – I cannot condone plagiarism of any kind) so the credit goes to you and your wonderful site! It’s my “go-to” recipe site. I’m going to lurk here for Fourth of July recipes for our annual trek to the Hollywood Bowl in Hollywood. You’re the greatest! Would Vanilla Almond Milk work? Or would it be too sweet? I have a whole box of it from Costco..
Ooooo ooooo I stumble upon this recipe on Womens Health! It’s delicious! Followed the recipe to the T and it came out great! Easy to make, recipe was easy to follow. Enjoyed the flavor and moistness. Definitely will be making it again. Thank you for posting this recipe. I recently made it for a gathering and everyone enjoyed it! I loved the way it looked. I am not an expert baker at all and this was so easy to make. I am planning to make it again tomorrow. I was wondering is there difference between using the refrigerated almond milk vs. the shelf almond milk? Will it taste just as good if I used whole wheat flour and coconut oil instead of vegetable? 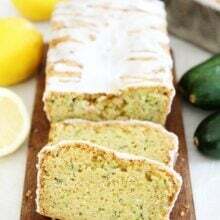 Has anyone tried this Lemon Almond Bread with ALMOND FLOUR instead of wheat flour? Giiiirrrllllll! We are soul-lemon sisters! I will not rest until I make this delectable delight! Lemons and almonds in one cake? Let me at it! I just did a whole post on my lemon addiction! !!! Check it out wp.me/p1lujJ-gg PS. Your photography is insane! I just made this tonight and I can’t stop eating it! Love this bread! Thank you! Do you think unsweetened vanilla almond milk would work? I’m anxious to try this recipe, but that’s all I have on hand at the moment! What would be the baking time if making mini loaves? I am not quite sure because I haven’t tried it. Reduce the time and keep an eye on them! Maybe 30 minutes and check them? So if anyone else who is trying to convert recipes to lower-fat versions comes across this and thinks it sounds awesome but they’d just try to lower the fat content, don’t. Some things just need to be left alone. Yes, but freeze before putting the glaze on! Hi looks amazing, can you freeze it? This looks amazing will definitely add this to my recipes . I too have a love for lemons!! So disappointed in this bread!!! It seemed like it had all the ingredients for a delicious bread! There is not enough flour for the amount of liquid as printed. The middle of the bread did not rise! Please advise! Looks really good. I don’t buy canola or veg oil. Just wondering if I could use coconut oil? great sounding recipe, I’ll give it a try BUT I’ll use Silk almond milk as it doesn’t contain carrageen. What a great recipe! Thanks for sharing! 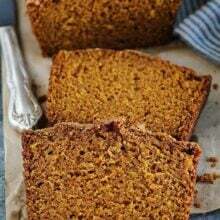 Can you make this in a 9×5 loaf pan? That’s all I have…I would guess increasing the recipe a bit?? Yes, the bread won’t rise as much, but that is ok! Does this freeze well? Can I freeze it already glazed? Yes, it freezes well. I always freeze before I glaze and add the almonds. Could I substitute maybe 1/2 flour with ground almond instead of using almond extract? I’ve made this before and it was delicious. I’ve now had a request to make it for a baby shower. Can it be tripled easy enough, or should I do three separate batches? Can something be substituted for the Almond milk if we don’t have it? If so, what? Looks delish! Yes, you can use buttermilk or regular milk. This has a really nice flavor! Great recipe. I substituted a gluten free flour blend, and it’s moist and delicious. Do you think it would work in a bundt pan? What adaptations, if any, would be needed for that? This bread was to DIE for! I cannot recommend it enough or thank the author enough! I made it last night so I could grab it and go for breakfast this week. My roommate and I tested it out and both were almost crying because of how amazing it was. I will DEFINITELY be making again for my boyfriend over Spring Break. Could Almond Flour be used instead of reg. Flour? I made this today, followed the recipe exactly, and it was perfect, wouldn’t change a thing. Looks delicious and as my mom has a Meyer Lemon tree I’m always on the lookout for lemon recipes! I wondered if this would work with regular milk or buttermilk instead of almond milk, which is not something I stock. I doubled the lemon juice and zest on my second try at this recipe. I did not find it lemony enough the first time. Can I substitute almond breeze for heavy cream? I haven’t tried it. It will be richer if you use heavy cream. Pingback: Homemade Almond Milk: Step-By-Step Directions With Photos, And More! I have everything but almond extract, anything I can sub in? would this recipe work using the Silk almond 30 calorie milk? I haven’t tried it, but I am guessing it would be just fine. Instead of AP flour, can we substitute it with almond flour? Have you tried it already? If so, was the almond flavor overpowering the lemon flavor? TIA! I haven’t tried it with almond flour. Let me know if you try it! This is my new favorite bread to make! I made mini muffins out of this as well. Perfect for my Easter Sunday! Mini muffins sound like a great idea! I will have to try them. Glad you liked the recipe! Can you use regular milk besides almond milk? Any suggestions to replace eggs and make it vegan ? don’t have any almond milk. will reg milk do? I used regular milk just as good. Made this “bread” yesterday. Oh my goodness! It is amazing. I can’t get enough of it. Honestly had to stop myself from eating 2 pieces. I am going to make another loaf today for work. I’ve made this many times. Amazing!! Can you use something other than the Breeze almond milk? I used regular milk, taste just as good. Excellent bread/cake.. I would classify this more of a poundcake than a bread. I have made it several times & is always good. The only trouble is finding the size pan it says to use, very odd size.. 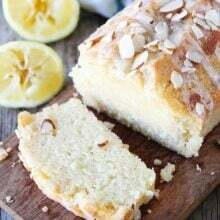 I tried the Lemon Almond Bread, it is so so delicious. I used only whole wheat flour and coconut oil for butter. I did it on Saturday evening and eat it all by Sunday evening. I will surely try it again and I did spread the words with others. Thanks for sharing. Recipe says baking powder. Video says baking soda. Mine is in the oven now. Hope powder was the right choice. A wonderful dessert to serve at a tea party. So refreshing. I used gluten-free bread as well and it turned out wonderful!! Wow! This looks fantastic! I’ve been craving lemon bread and this looks like the perfect recipe. Thanks for sharing! Yes! I usually freeze without the glaze and add it after it has defrosted. I stumbled across this on Pinterest. These pictures look so good. I’m sitting at my computer screen salivating over the delicious looking bread! This just makes me want to get up and bake. I hope it tasted as good as it looked! The Lemon Almond bread was a hit with my sister who is a very picky person. She just loved it and so did my family on Thanksgiving. Thank you. Love this recipe, it’s my go to lemon dessert. I usually garnish with fresh blueberries. Can i make it with almond flour instead of all purpose flour? Almond flour might make it too dense and dry. I haven’t tried it though. Looks so yummy! Can you use almond flour without a problem? Love a reply. I haven’t tried almond flour. I am guessing it would change the texture and flavor. Let me know if you try it! This is seriously one of my families favorites!! I make it all the time. I have one question can this bread be frozen? 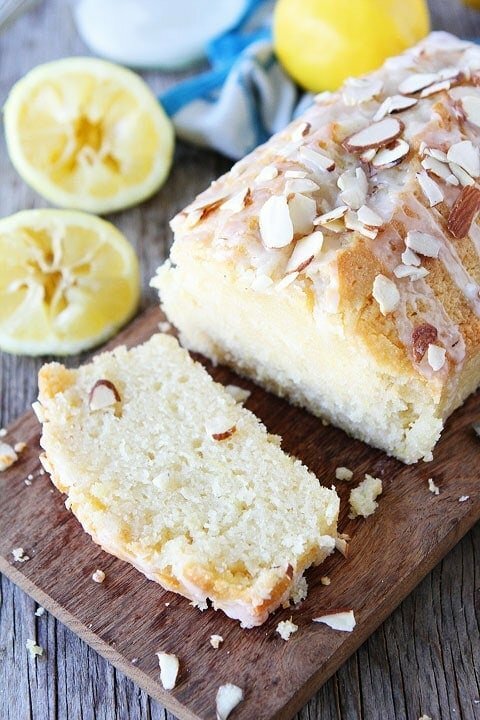 Hands down the best lemon almond bread ever. I have shared this recipe with so many people. I make it for work events all the time (per my co workers request). Running the lemon zest in the sugar is pure genius (I do this to my lemon blueberry pound cake). Thank you for sharing!!! This is a great recipe. I love the flavors and texture. I did substitute half and half for the almond milk and it was still great. I also substituted olive oil for vegetable oil, still great. Made it twice already this week. Thanks. This recipe is amazing! I don’t ever have Almond Milk at home so I just used regular cow’s milk, and it was delicious. I have a food blog, The Big Green Bowl, and I shared this recipe on the companion Face Book page. I have shared several of your recipes. I know whatever I try from your blog will be good! Thank you!